When one sees a very large tree in a forest, it just seems natural to ask, “how big is that tree?” In addition to satisfying our innate curiosity about tree size, measuring tree diameters can provide quite a bit of information about a forest stand. As discussed in Chapter 5 on stand characteristics, there is a direct relationship between tree diameter and tree crown. The bigger a tree’s diameter, the greater the amount of foliage it has. Tree diameter data can inform foresters about crown competition, stocking levels, and forest health. Stand management decisions, such as when and how much to thin a stand, rely heavily on data derived from measuring tree diameters. In addition, tree diameter is needed to determine a tree’s wood volume. Look at the diameter distribution curve in Figure 3.1 below. Without having seen these trees, what can be inferred about the stand? The curve indicates that there are many small diameter trees around 14 inches, a group of large trees around 32 inches, and a smattering of trees with diameters over 50 inches. Do the groupings indicate different age cohorts? Is the stand approaching an old-growth condition? 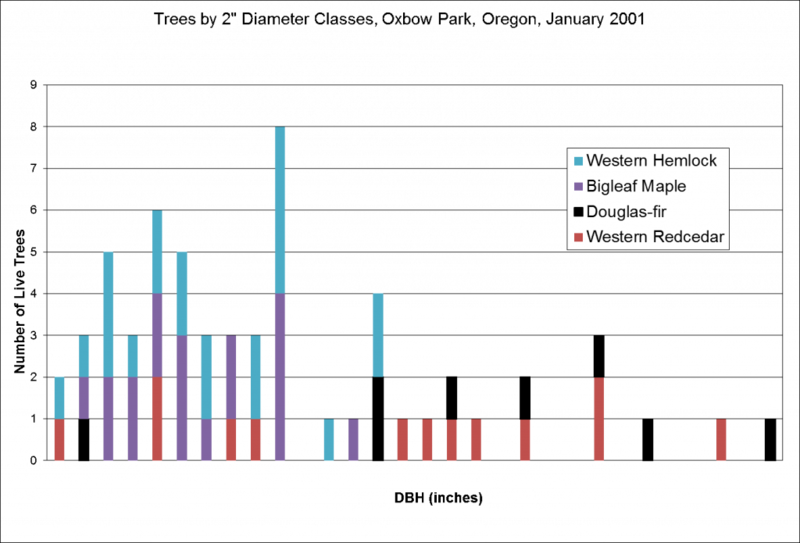 Looking more closely at the data, note that the small trees are shade tolerant species, and the less tolerant Douglas-fir tends to be in the larger size classes. What might that tell you? Figure 3.1. Trees by diameter class. Source: Data collected by Mt. Hood Community College Silviculture class January, 2001.